Our good friends at Cosy Under Canvas are offering the perfect romantic getaway with your loved one. 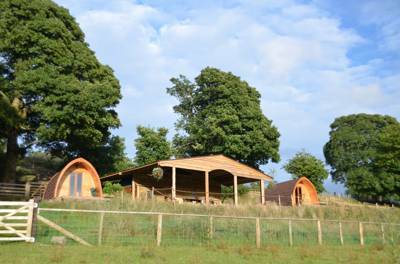 You can stay in one of their domes, all now with wood fired hot tubs - the perfect balance of camping and comfort. Prices are from £160 for a 2-night stay. To book, please visit their website and don't forget to mention Cool Places! Please note, offer is not valid during peak season. 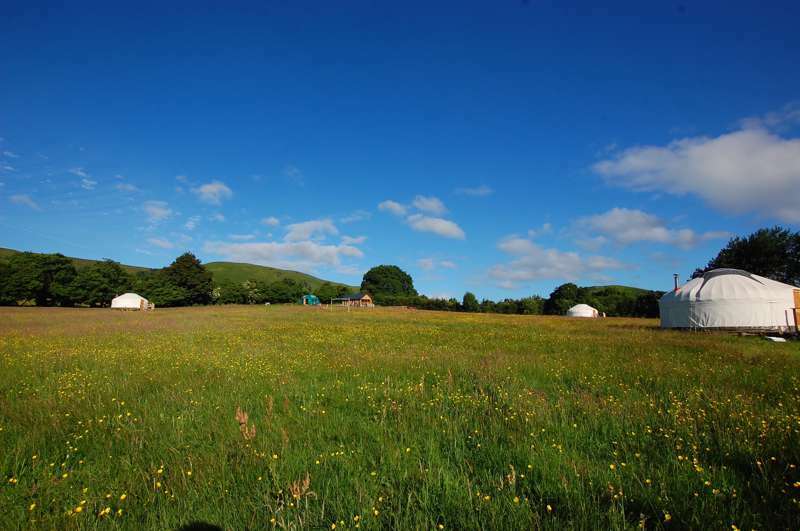 Twisting and turning along the winding country lanes, surrounded by undulating green and yellow fields deep in the heart of the Welsh/English Borders, it's almost impossible not to get childishly giddy about the treats that await you at Cosy Under Canvas. 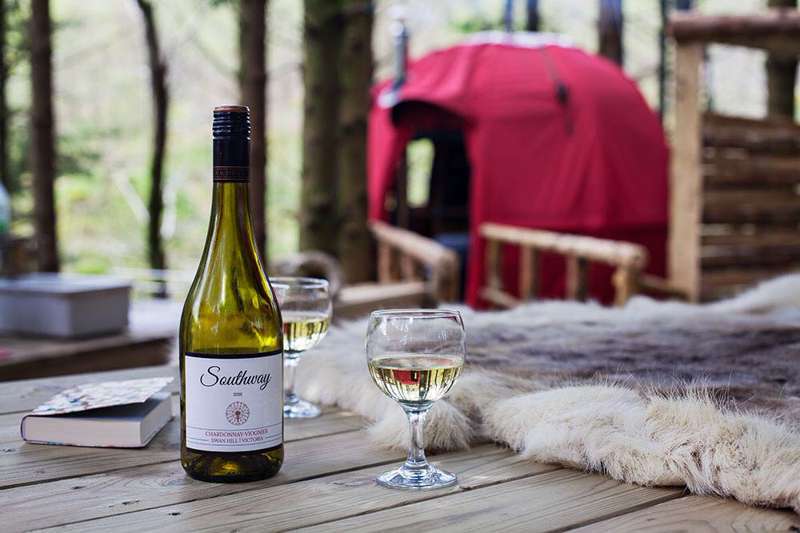 As you slowly roll into the car park, offload your bags into the wheelbarrow kindly provided for you, and walk along the wooden manmade pathway across a sea of wild flower wetland, it quickly becomes apparent that when it comes to glamping, you can never underestimate a woman's touch. Owner Emma has been running Cosy Under Canvas for seven years now, and oh, does her experience resonate throughout the site! From the little welcome boards with your names written in chalk, to the homemade cakes left out for your arrival. The site is made up of seven pitches, all spread out amongst a small private woodland, and cleverly hidden from each other by the trees. There are five spacious and cosy geodesic dome tents – Hazel, Rowan, Holly, Oak and Beech; and two beautifully furnished smaller domes, Ash and Willow. 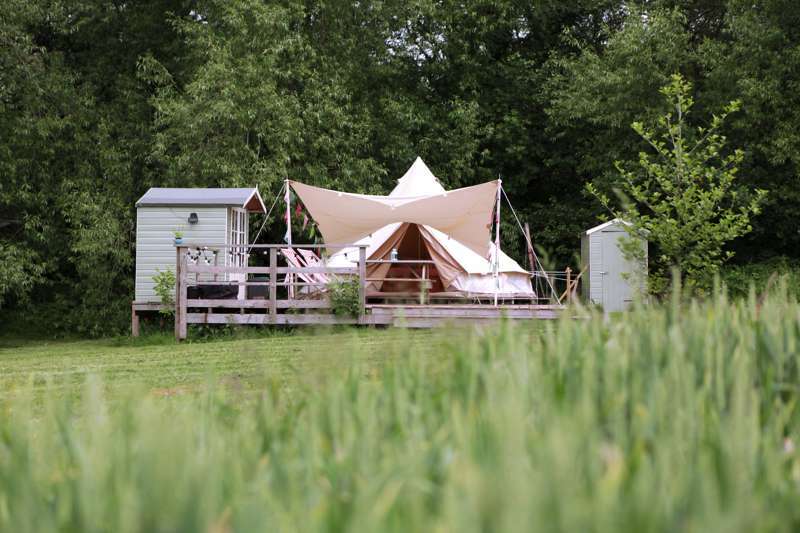 All the pitches come with their own private firepit, recycled gas bottle chimenea, compost loo, indoor wood-burning stove, sheepskin rugs, double or king-size beds, kindling, beanbags, lanterns and tea lights. The domes all come with their own private wood-fired outdoor hot tubs and some have views overlooking the surrounding wild flower wetlands. There’s a ‘cosy corner’ which is filled with board games and activities for kids and a large communal sheltered kitchen which comes equipped with everything you could possibly need for cooking up a storm over a campfire, from tripods, skillets and pots and pans, to chopping boards, coolboxes and even a brand new pizza oven. There’s also fresh drinking water and a handful of gas stoves in case the rain tries to put a dampener on things. The two communal showers are heated by the large wood-fired Aga in the kitchen – a nice communal touch, as it relies on everyone chucking in a log from time to time to make sure the water stays hot. It’s no real wonder then that Cosy Under Canvas is also the proud owner of a much coveted gold Green Tourism Award. Add up all of these seemingly endless well-thought-out touches and you can easily see why this is a woodland retreat like no other. It’s a series of camping oxymorons: rugged, earthy daintiness; muddy, organised plots; rustic, frilly communal areas; and axes lying next to hammocks. The kids will never want to get out of the hot tub, and couples will only want to cosy up with each other next to the fire and stare up at the dark night starry sky above them. Should you decide to venture out of cosy-camping central, then you will no doubt stumble into the literary haven of Hay-on-Wye – the host town for the annual Literary Festival and awash with excellent book shops. There are plenty of organic food delis, antique stalls and bric-a-brac gems to keep you occupied for a full day. 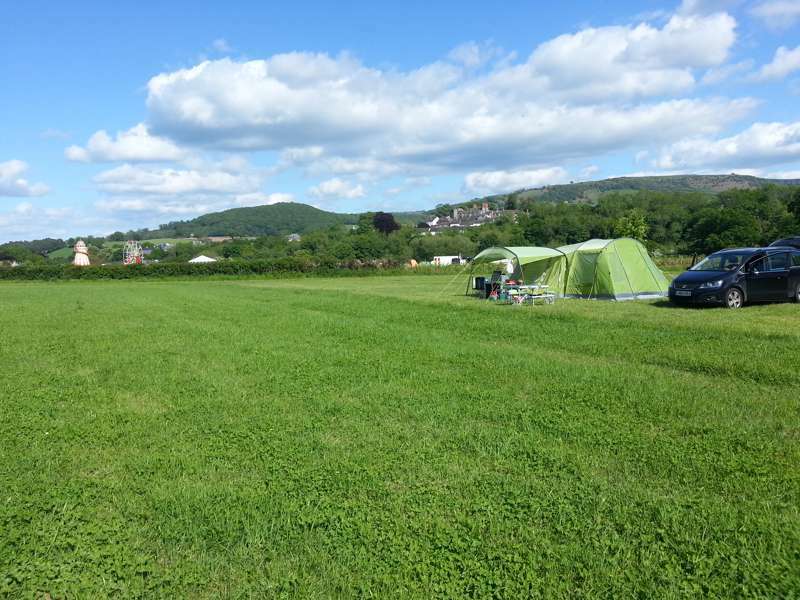 But if you prefer the more outdoorsy side of living, Hay also happens to be situated within the 520 square miles of the Brecon Beacons National Park. That’s 520 square miles of uninterrupted, unspoilt, and truly outstanding natural beauty. And yes, yet another excellent reason to choose to stay at Cosy under Canvas. 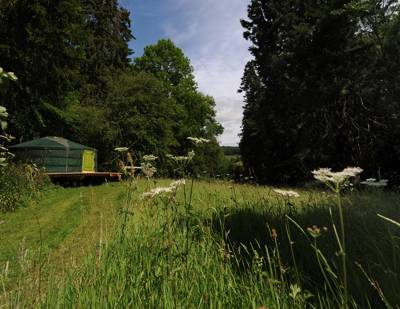 Award winning Cosy Under Canvas is a woodland glamping site on the Welsh borders, close to the famous book town of Hay on Wye. Perfect to satisfy your craving for the outdoors with no compromise on comfort. Think comfy beds, snug duvets, fluffy sheepskins and cosy rugs. But we’re off-grid and eco-friendly with private compost loos, steamy wood-fired showers and solar lights. 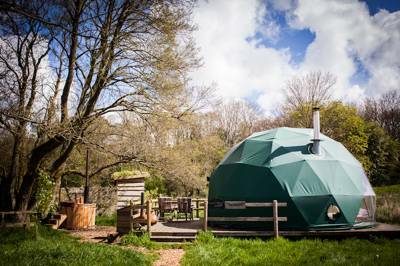 There are five large spacious geodomes and two smaller cosy ones, set on wooden platforms each with a private fire pit and stylish wood burning stoves that can be stoked up to keep you toasty into the night. The spacious domes are 6m in diameter and 4m high. They sleep up to four adults comfortably or 5 or 6 if the kids are with you. Two sleep on a comfy king size bed, made from locally sourced wood, and the extras on raised futon beds. 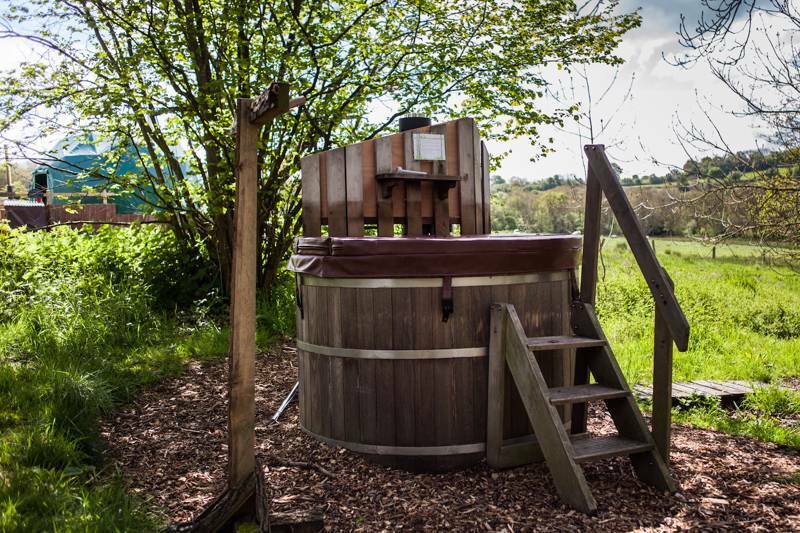 All domes have exclusive use of a wood-fired hot tub, perfect for steamy nights under the stars. There two fully kitted, shared camp kitchens, a cosy corner, and a cosy lounge with everything you need to make the most of time out, chilling out and hanging out. We’ve thought of everything to get you back to nature in style. We keep our impact on the environment to a minimum. 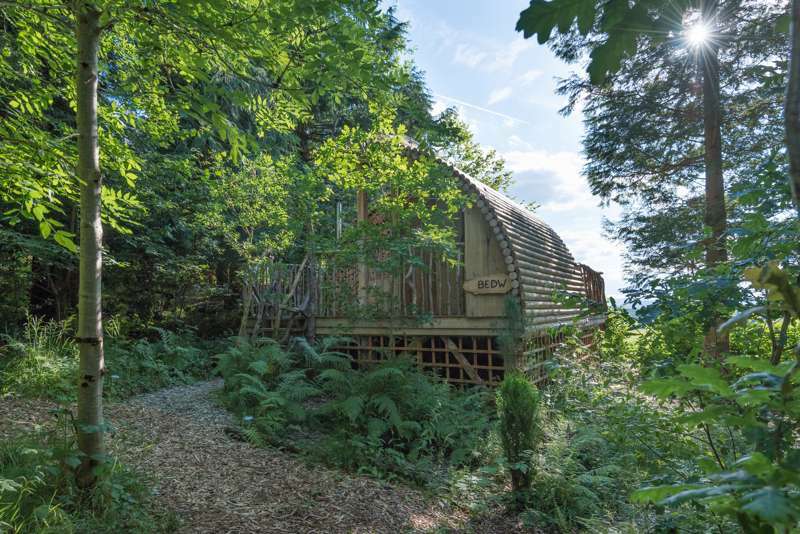 There are private compost loos and washrooms, plus eco wood fired showers with a canopy view. Alternatively use the new washroom and biomass boiler heated power showers a short walk away. Campfires are positively encouraged and there's a fire pit in-front of each unit. There’s plenty of seating for everyone and the large spaces around the fire pits mean that campfire cooking is a must. All dig into a one-pot stew or prepare a BBQ feast. There’s something to keep everyone entertained whatever their age. Children will enjoy following the trail round the site to the feely boxes, swings and den; and using the activity book for ideas of woodland games to play. If there’s a big group of you set up a boules or a cards competition or get creative with the crafty bits and bobs in the cosy corner. Two cosy domes and five spacious geodesic domes each sleep up to four people, or six in the larger domes, and contain a double or king sized bed and two futon beds with memory foam mattresses. Inside, you’ll find Welsh blankets, throws, a wooden storage box, candles, and cotton bedding.There’s a chimenea on the decking and you can build a campfire in your private pit, or if you prefer more conventional cooking there’s a massive communal kitchen, BBQs, and tripod stands. Throw in a 'cosy corner' with games and activities, a 'cosy lounge' for relaxing in, private wood-fired hot tubs, private compost loos, complimentary wood on arrival, recycling facilities, hammocks, welly racks, fresh spring-water tanks, ice packs and cooler boxes, and dry storage containers, and you’re bound to be a very cosy and happy bunny. 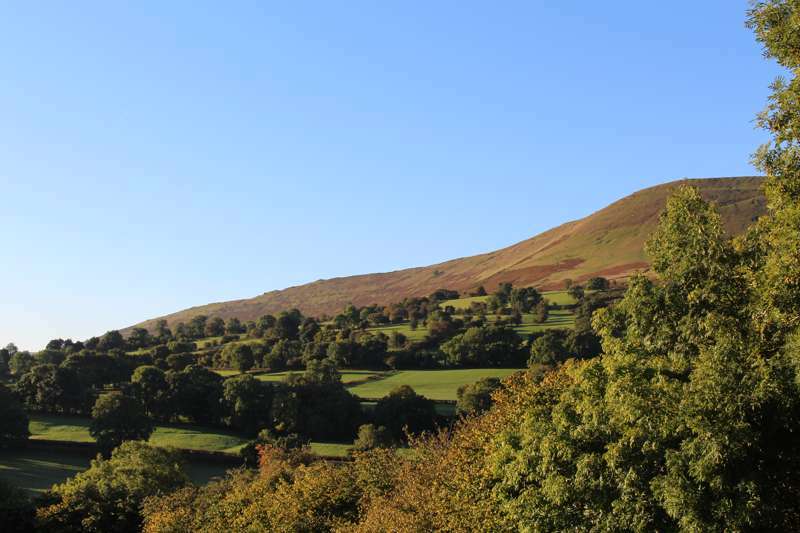 The site lies in the Brecon Beacons National Park (01874 624437), so any route you choose to take will be a walker’s paradise. Nearby Hay-on-Wye is brilliant for rummaging around boutiques and galleries. 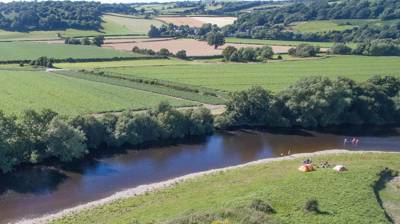 Or, for something more active, canoe down the River Wye, 5 minutes from Hay’s town centre (01497 847213). You can be as active as you like. Stride a section of the Offas Dyke Path which forms the border between England and Wales or try climbing in the National Park. For the real adventure seekers try gorge walking, kayaking, quad biking, climbing, caving or the nearby assault course. There's a fabulous deli, butcher and baker in Hay for those all important provisions. For a contemporary eatery, relax in the Globe (01497 821762) with a Penguin Classic from one of Hay’s many bookshops or try Richard Booths Bookshop Cafe for tasty locally sourced treats. For cool cocktails and stunning vintage & industrial furniture, and household items, try The Old Electric Shop. While Hay on Wye has a multitude of lovely pubs and cafes, you could also try The Roast Ox (01497 851398) at Painscastle for a great value and tasty traditional pub meal. Small domes for up to 2 people cost £130 for a mid week break in low season to £684 for a week in peak season. 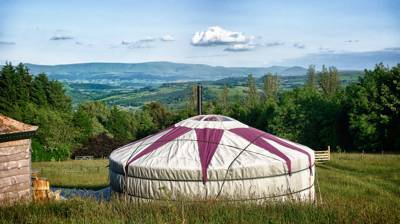 Larger domes cost £170 for a 2 night mid week break in low season to £796 for a full week in peak season. Minimum stay 2 nights in low, mid and high season. Minimum stay 3 nights in peak season. 20% discount for bookings of 5 nights or more. Hot tubs are an additional charge, £35 - £70, dependent on size and length of stay. Satnav will be your best friend here. If the postcode isn't recognised pop in 'Newchurch'. From Hereford, follow the A438 towards Brecon for 13 miles, staying on it until you enter Wales. In the village of Clyro you'll see a brown 'Glamping' sign. Turn right then right again and Cosy Under Canvas is on the right after 4 miles. Take the train to Hereford, and then hop on a local bus to Hay-on-Wye, where you can either cycle to the site or Emma will collect you (if pre-arranged).